Hi everyone! 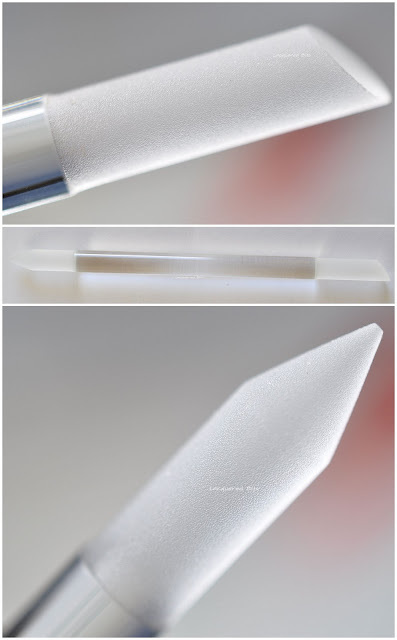 Today I have a review of Aveniro glass nail files* for you. About a month ago Eva from Aveniro Ltd. contacted me and asked me if I was interested in trying out their nail files. After checking their web site www.aveniro.com, I decided to try them. 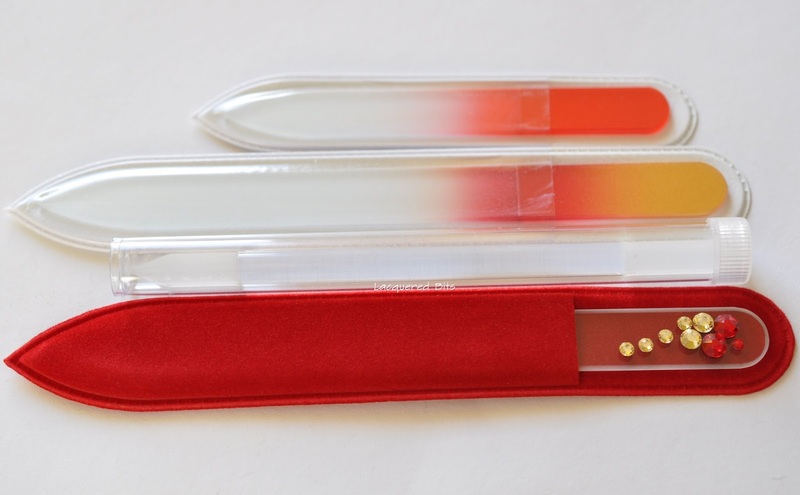 Aveniro Ltd. is a unique glass nail files producer from Czech Republic. Their glass nail files are made of the Bohemian crystal and they are renown for their unlimited lifespan, efficiency, simple maintenance and particularly their positive effect on the nails health. They sent me one small and one medium double-sided coloured nail file, one decorated with crystal stones double-sided nail file and one multifunctional manicure stick. This one is the one decorated with crystals. And it comes with this soft velvet looking pocket that protects it. These two came in plastic pockets. And in the photo bellow you can see the grit of all the files. I gave them all a trying period of three weeks and the grit of all of them stayed intact through the whole time. That is great, because most of the drug store nail files I have tried lost their grit after two or three filings. These files weren’t hard on my nails. I don’t know the number of the grit they have, but it’s perfect. 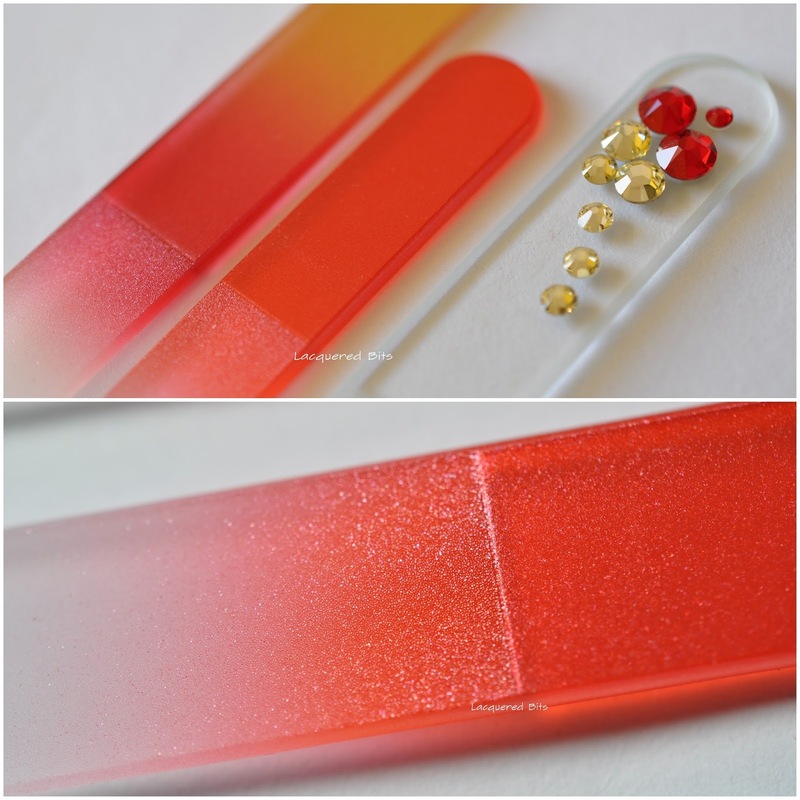 I own one quality glass nail file from O.P.I and these have the same quality. So I definitely recommend Aveniro glass nail files. And I also got one multifunctional manicure stick. At first I didn’t know what it was for. But then I checked it on their site and now I know. One side is for cleaning under your nails and the other side is for pushing back your cuticles. The part on the upper photo is for the cuticles and the flat end is smooth so you don’t scratch your nails while pushing back the cuticles. I am very satisfied with these files and I will be using them, hopefully for a very long time. And what are your favourite nail files? I have tried so many files with different grit, but I am most satisfied with glass nail files and these are among them. I love the glass files! Great review!